Pizza HutPizza Hut ran an ad inspired by Hillary Clinton. In 1999, Pizza Hut ran an ad mocking Hillary Clinton’s then-rumoured aspirations to be New York’s senator. 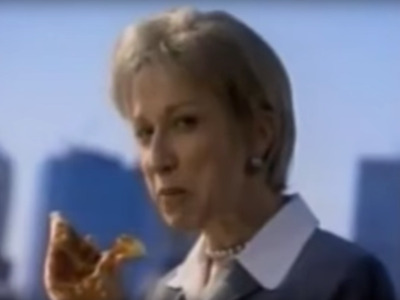 In the ad, a blonde woman with a bizarre accent and wearing a pantsuit promotes the “Big New Yorker” pizza. “$US9.99, what do they think this is? Arkansas?” a policeman leaning against the podium drawls in a thick New York accent. Meanwhile, Clinton’s anticipated rival – then-New York City Mayor Rudy Giuliani – was backed by a member of Pizza Hut’s board. Billionaire Kenneth Langone and his wife had already donated $US1,000 each to Giuliani’s Senate exploratory committee when the ad first ran in late 1999. Tricon Foods, then Pizza Hut’s parent company, had donated an additional $US2,500.